A game of three penalties went the way of Mansfield Town as Hayes & Yeading United went down to their third two goal defeat in a row. Manager Garry Haylock shuffled his squad and changed his formation in an attempt to arrest a poor run of form which saw his side winless in the previous five games. In came George Daly to partner Sean Canham up front in place of Esmond James and Toby Little was preferred to Dale Binns on the left hand side making a 3-5-2 formation. For much of the first half, the two sides were evenly matched. United had two early half chances. James Mulley hit a shot from outside the area following good work from both Marc and Sean Canham but he placed it straight at Mansfield goalkeeper Alan Marriott. Then a long Matt Ruby throw in was flicked back by Sean Canham into Little's path but his header drifted across goal and wide. United had a wake up call at the back as Kyle Nix floated in a dangerous free kick which Robert Duffy headed inches wide of the far post. However, they were in an attacking mood and Ram Marwa's shot from Daly's clever pass was goalbound until Luke Graham deflected it into the side netting. The action hit a lull until Little attempted another header which was an easy catch for Marriott. However, on 35 minutes, Mansfield got the ball in the net when Ryan Williams's throughball was headed beyond Simon Overland and into the near post corner by Jake Speight. Unfortunately for him, he'd just run too early and was flagged offside. It was only two minutes afterwards that the opening goal was scored by Mansfield, as Lee Briscoe's cross was fumbled by Overland and Duffy had a straightforward finish. Just three minutes into the second half, the first of those penalties was awarded as Speight went down under the challenge of Adam Green whilst contesting Briscoe's throw in. 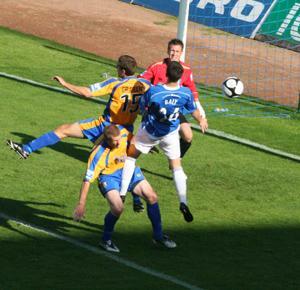 Duffy claimed his second goal by sending Overland the wrong way. United got another shot on target when Danny Allen-Page cut in from the right flank and let fly from 25 yards, but Marriott was equal to his drive, diving to catch the ball to his right. 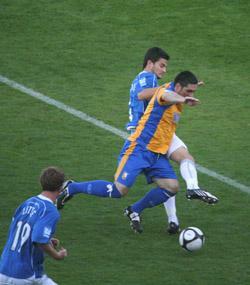 Substitute Scott Fitzgerald was to make a big impact soon after coming on as United were awarded the second penalty. Marc Canham's throughball was chested away from Sean Canham by Scott Garner but past his own keeper Marriott, who seemed surprised to find Fitzgerald challenging the ball and fouled him in the process.Sean Canham beat his outstretched hand to plant the ball int he right hand corner. But United's hopes of applying pressure for an equaliser were dashed just three minutes later as Ryan Williams flicked the ball up onto Tom Cadmore's hand in the penalty area and another penalty was awarded. Duffy completed his hat-trick by sending Overland the wrong way. Little tried his luck from 30 yards but Marriott was again able to keep out the long range effort. 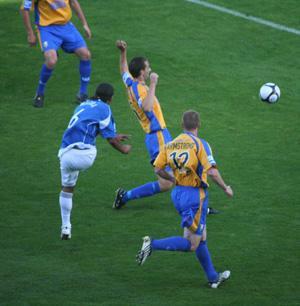 Meanwhile Overland held onto Speight's header despite an awkward bounce right in front of him. United remained committed to chasing the game and Sean Canham's pass down the left flank allowed Fitzgerald the room to cross for Binns whose header was brilliantly tipped wide by Marriott. Two minutes later Marriott foiled Binns again as his low shot was blocked following Sean Canham's pass throguh a crowded penalty area. 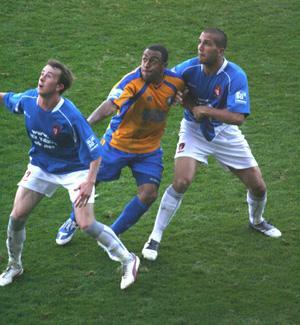 However, Mansfield steadied themselves and were able to play out the rest of the match without further threat to their lead, and Speight almost increased the advantage but lifted his shot too high, and in stoppage time, Cadmore got in a block to deny Steven Istead following tricky on the left from Levi Porter. United Man of the Match: Sean Canham.